You are here: Scotsman Ice Systems » Every ice-eventuality covered! Hubbard’s Ice Duo bundle is the ideal multifunctional, space-saving ice maker. That’s because it has a compact footprint yet delivers a choice of different ice types that can meet the needs of just about every application in busy hotels, restaurants, bars and clubs. 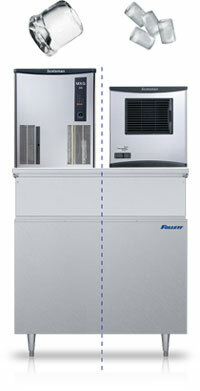 The Ice Duo sits two different modular ice machines onto a single ice storage bin. Each machine can produce different types of ice – the bin’s storage compartment has a divider wall that keeps them separate. For example, an Ice Duo could feature a Scotsman MXG 328, producing classic gourmet supercube ice cubes, and a Scotsman N 622, which makes the new, versatile nugget cube. The two could sit side by side on top of a Follett FOL-1025 storage bin. Another Ice Duo bundle could have a machine making dice ice cubes alongside one making flake ice.